This is the Topeak Ridecase for iPhone 6, a lightweight solution specifically designed with the phone in mind. 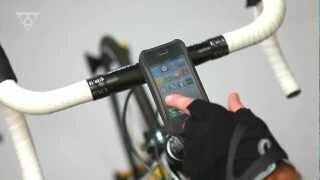 This allows you to use your phone as a gps or trainer when cycling giving you precise readings on your phone screen. The case has the ability to pair up with a mount which can fit to your bike (sold separately). Once the mount is on your bike you are able to adjust the angle of the mount and also the rotation, giving you the most comfortable position. The case itself has a sleek carbon finish and offers extra durability when you aren't using on your bike. Machinated from a high grade aluminium the Ridecase offers next level strength and durability. Overall this is a safe and secure phone case giving you that extra piece of mind knowing that your phone is protected. Coming in two colours you have a choice between White and Black. Due to the precise tolerance fit of RideCase with iPhone*, any protective film on the back and sides must be removed before installing RideCase or your iPhone may be damaged by inadvertent release from RideCase while riding.